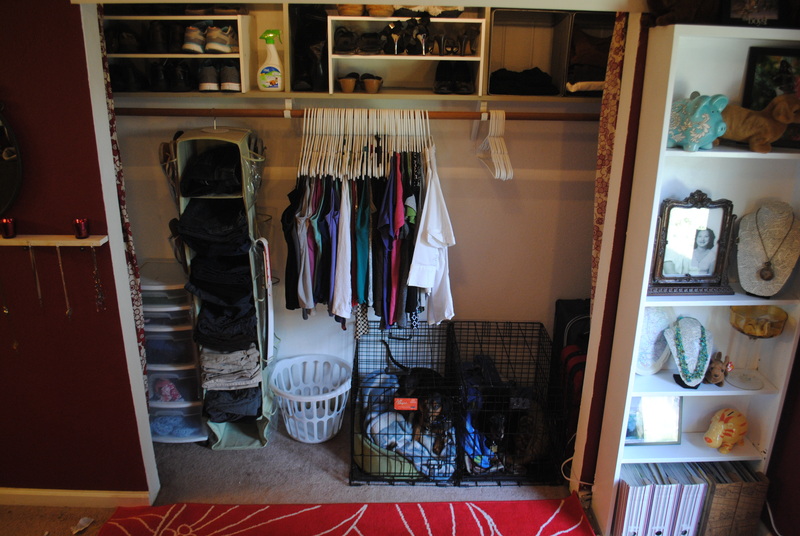 A lot has changed since I last posted about my Master Bedroom Closet back in 2013. While I really love having the white walls, gray shelves, updated lighting and track system for the curtains so much more has changed. 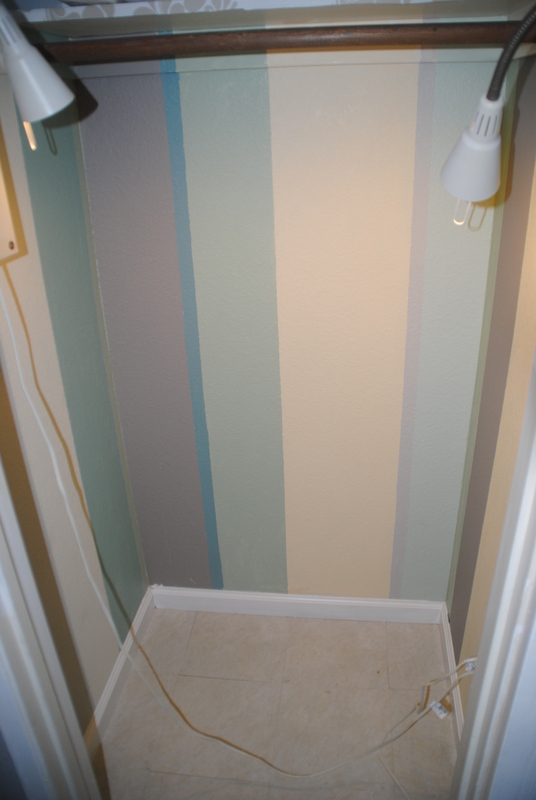 This post details the new baseboards, paint and lighting. 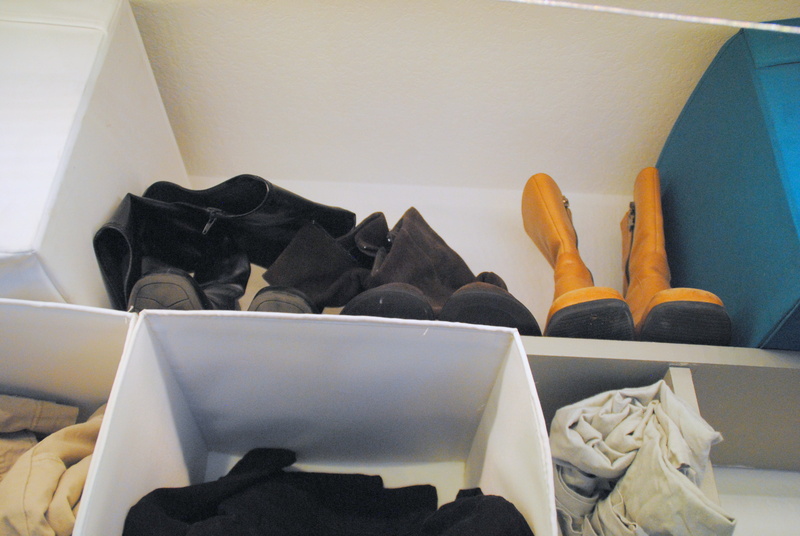 In the second post I shared about the organization, shoe shelves and the clothing boxes. 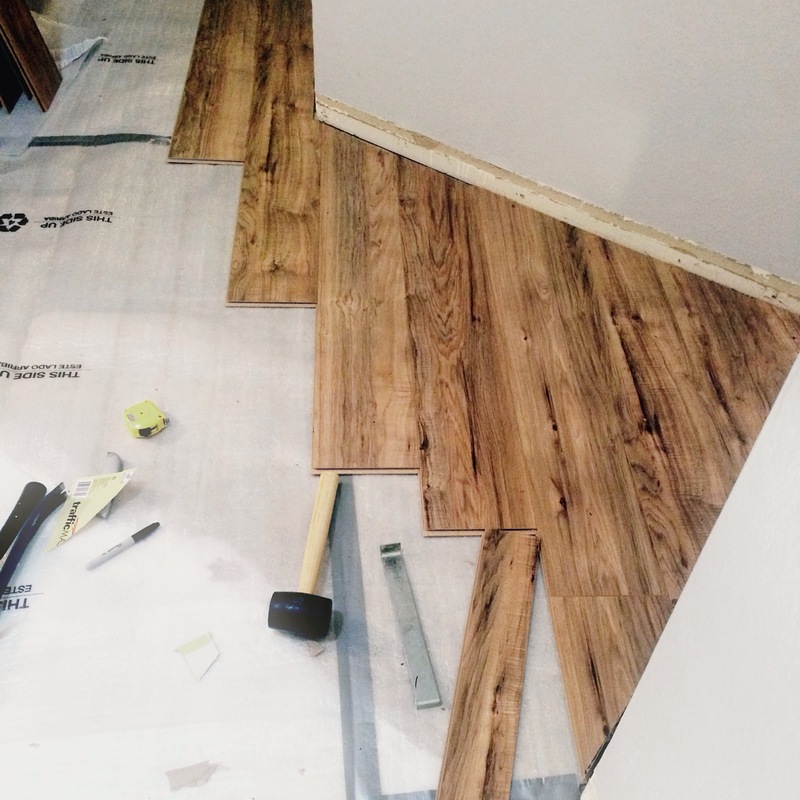 I already shared a blog post about how I prepped and installed the flooring in the master bedroom here but as you can see, it really does make the whole room look bigger. 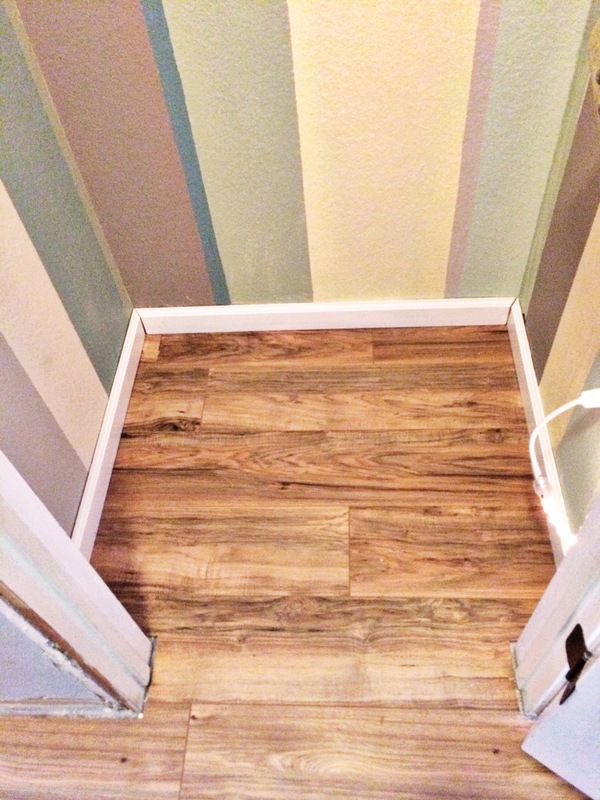 After the floors were done I began to reinstall the baseboards and then restock the closet. On the far left of the closet I installed supports along the walls and then laid shelves across (just simple 1x4s). 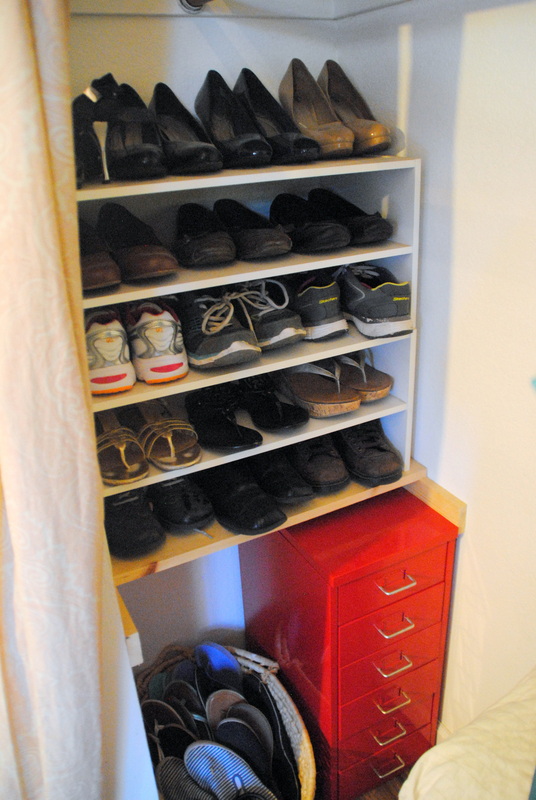 While I didn’t plan on it at a time, this created the perfect spacing for my shoe shelves. Underneath the shelves I have an old basket from Ikea for flip flops, sandals and shoes I’m too lazy to put away. This accounts for the majority of my shoes, I do have some boots up on the upper shelves but pretty much everything fits in here. 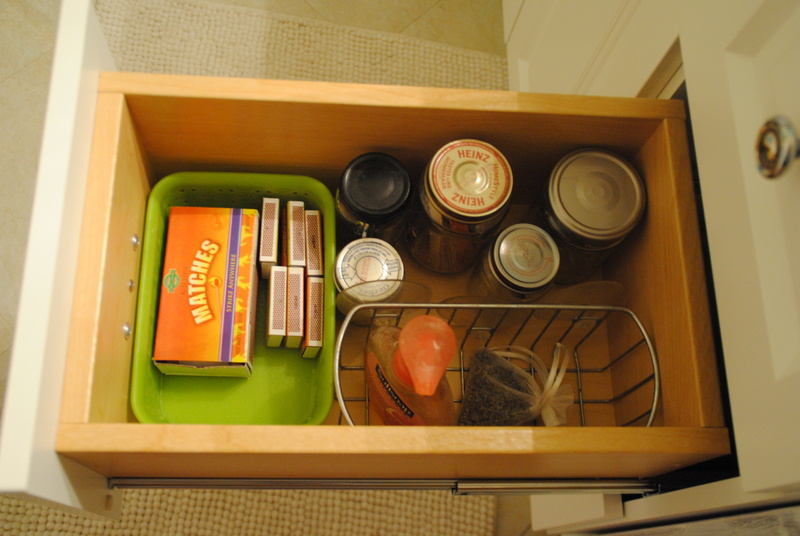 I won’t give a drawer by drawer account because: boring. 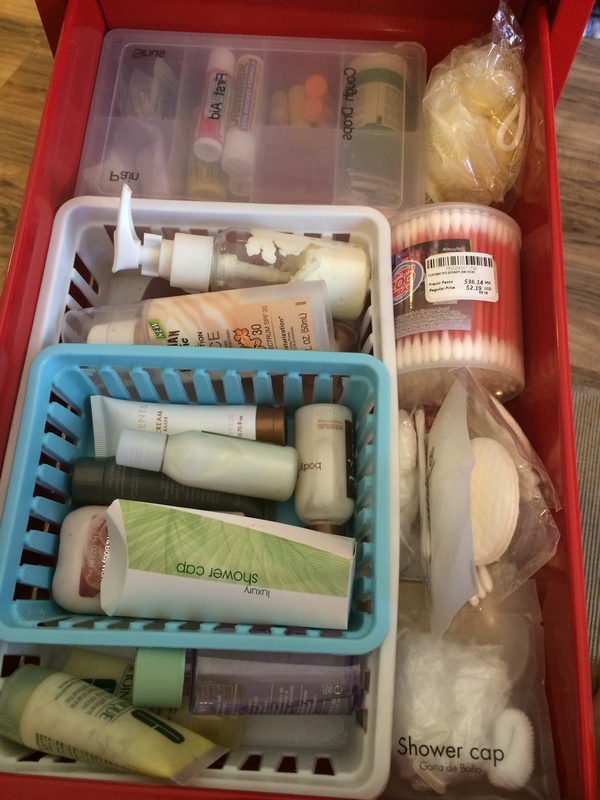 I like that I can easily pull out the drawers to restock my toiletry bag before a trip. 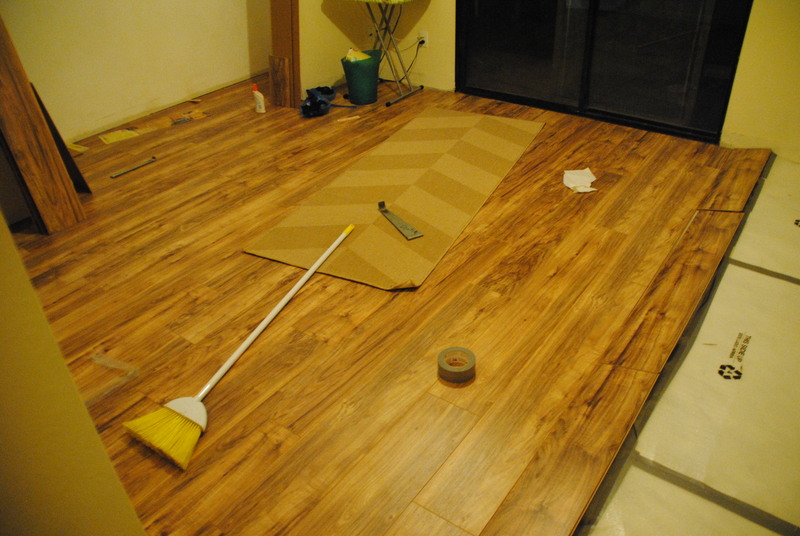 Of course the laminate floors help with that. The right side of the closet is now filled with my book boxes (that I shared about here) which leaves plenty of room in the middle for hanging clothes. On the top shelves I still have the fabric boxes for my pants, winter sweaters and bed sheets. 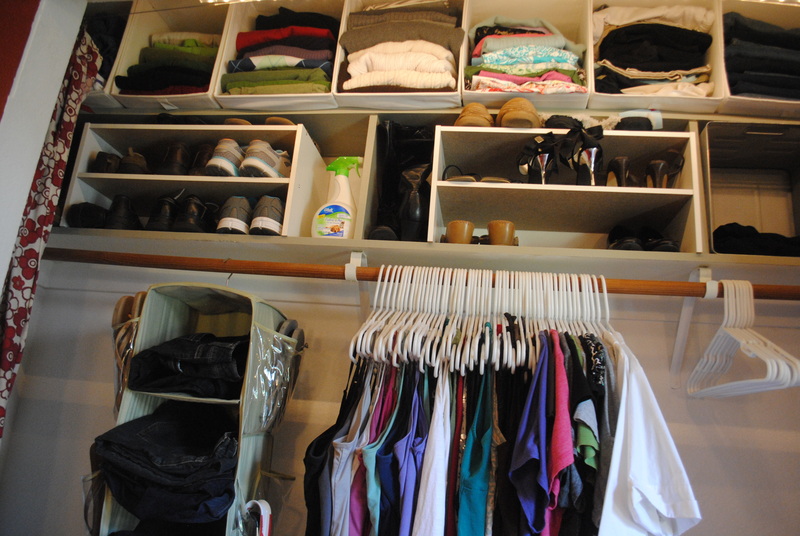 All in all, I love how functional my closet is and the storage it provides. It may not be a huge, walk in closet with custom shelving but it does the job. When I started the challenge to blog all the projects I’d been working on, I promised myself not to start new projects. 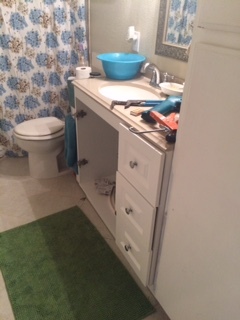 So in August, while I was dog sitting for my parents, I got the desire to finally do something about the cabinet in my guest bath. The problem is simple. 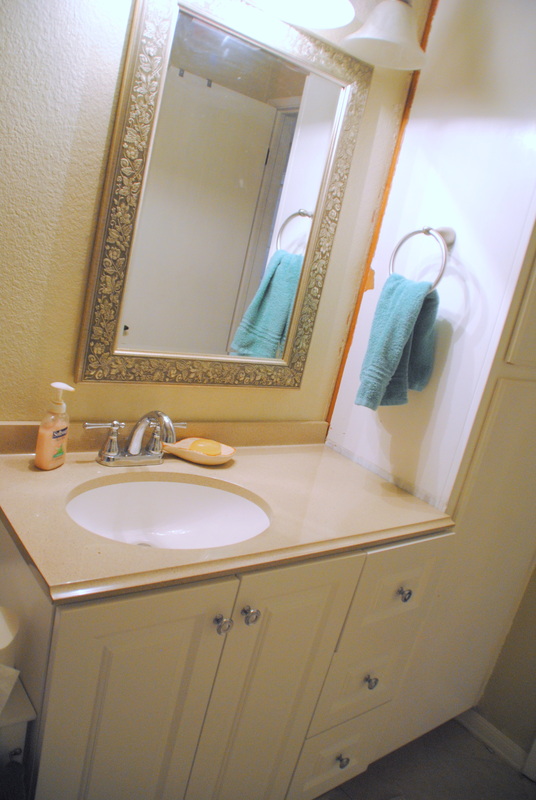 The sink and countertop are one continuous piece and stretch allll the way along the wall. Which I dislike. There are also stress fractures in the bowl of the sink. 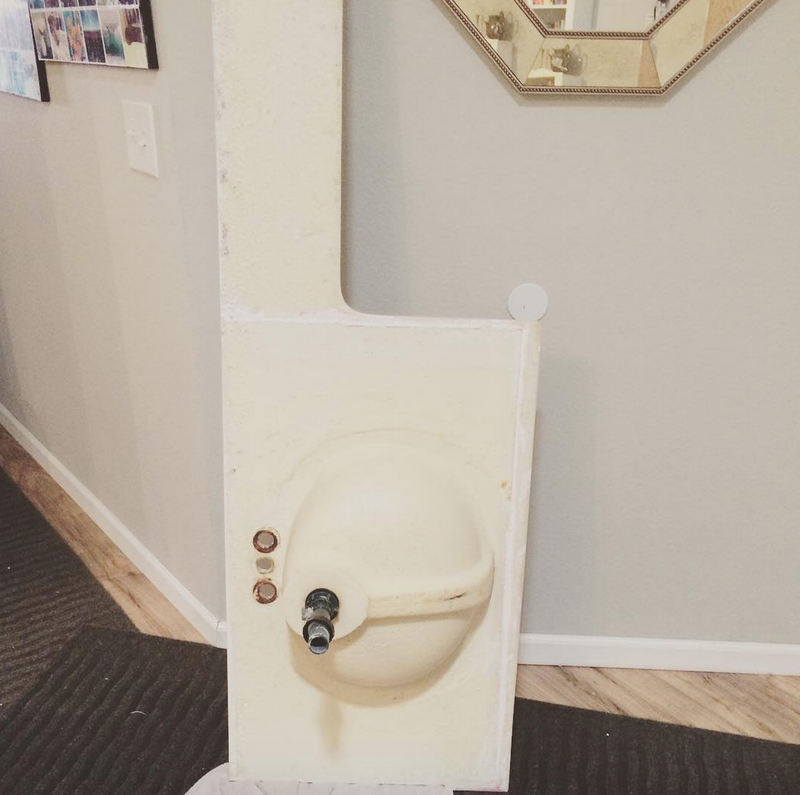 So after shoring up my confidence with a few YouTube videos, I turned off the water valves, unscrewed the faucet, then the P-trap, and began to wiggle the counter top loose. 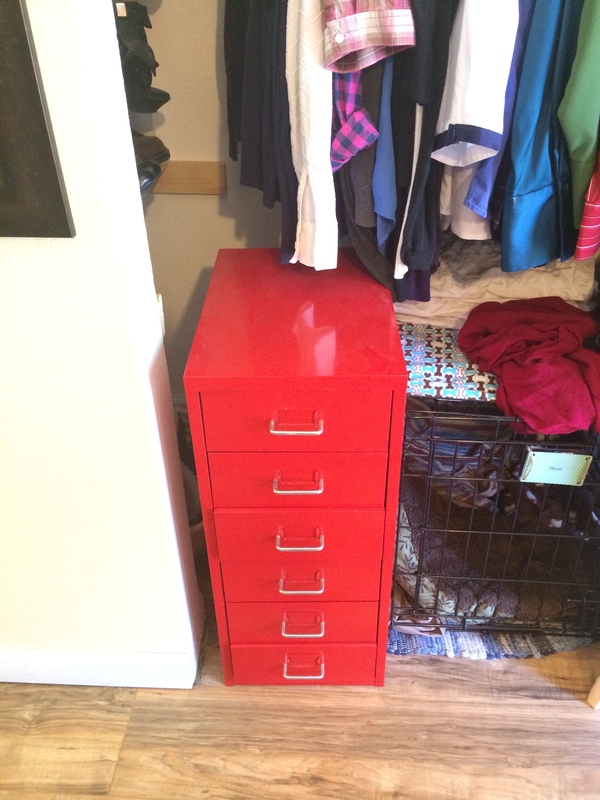 Next up was the cabinet. 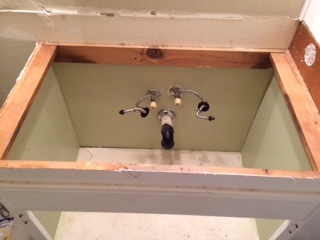 After removing the doors, I used my hammer and crowbar to bust it to pieces and it came apart pretty easily. Obviously when I installed the floor tiles back in 2013 I did not go under the vanity so it was a good chance to use up the spare tiles I’ve been hoarding saving. First I did a little patching due to a crack in the concrete and then primed the subfloor. 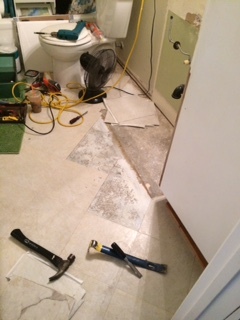 Putting down the new tiles was easy enough, although several of the adjacent tiles needed to be replaced. 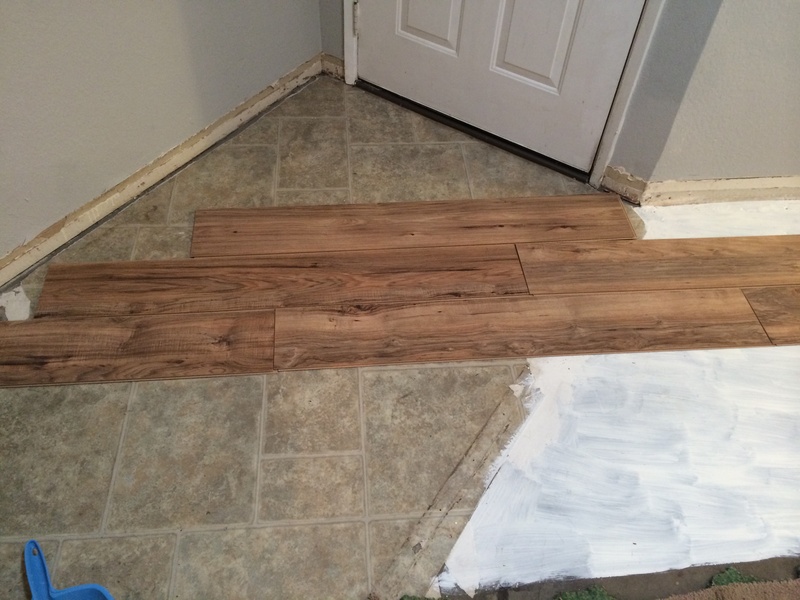 There’s just one more tile left to replace that goes right up to the toilet which will require a little more work. Once the tiles were in it was time to bring in the new cabinet. I’d picked it up from Home Depot and got a few of the workers to set it carefully in the backseat of the Cadillac. With some blankets to protect the frame and seat it was fine. My neighbor across the street helped me move it out of the car and into the garage. 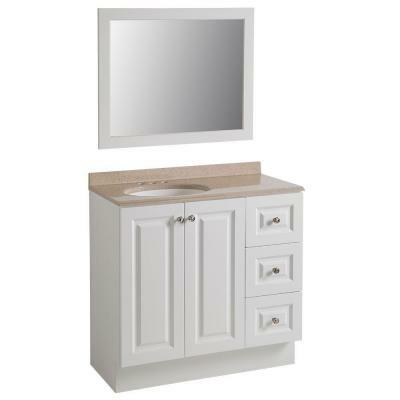 Here’s the vanity and sink on the Home Depot website. 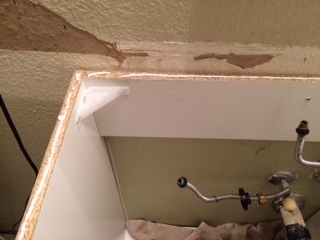 The whole cabinet was leveled and then got screwed into the wall studs. 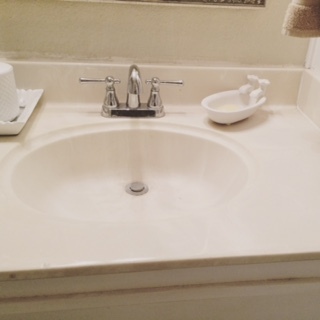 Since the sink on this unit is off center there was a difference of 5″ which required a new p-trap. 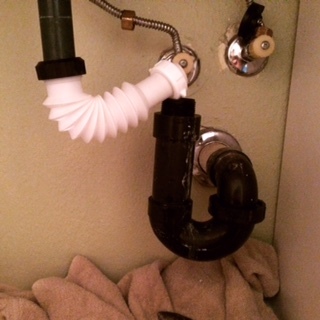 I also replaced the drain flange with a piece that included a new sink plug. 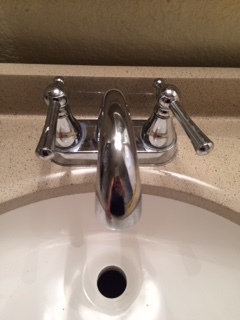 Since I was reusing my newish chrome faucet, I took the time to really clean and polish it up. It did need the filter to be cleaned out since we have such hard water that it’s easy to get clogged up. If you’re confused, or would like a very basic sketch up of how this plumbing works, this site and diagram is a good place to start. 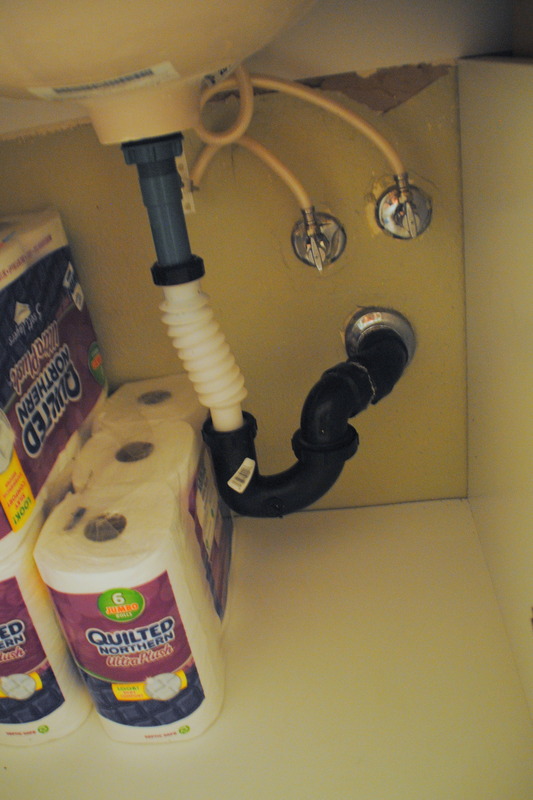 One problem I had is that the water supply lines were all sorts of cramped and barely reached up to the faucet. They were also leaking so I hired a plumber to come in for a couple hours to replace the lines and upgrade the drain extension to position the p-trap better. Money well spent! Once that was done I could secure the counter by adding a bead of clear construction glue and carefully setting the counter in place. In order to get it plumb against the cabinet I had to take off a long trim piece from the tall cabinet so I’ll need to re-sand and paint that piece. 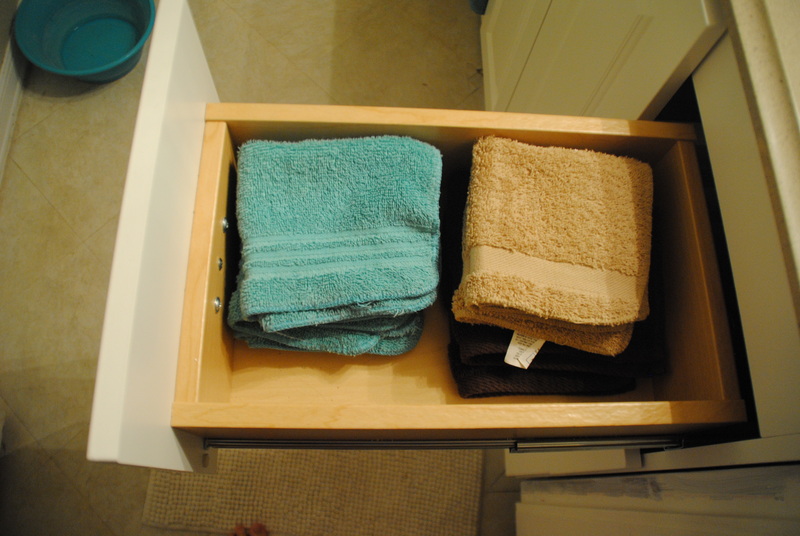 One thing I love is the drawers which give me shallow storage for bath items so they don’t get lost in the deeper cabinet. 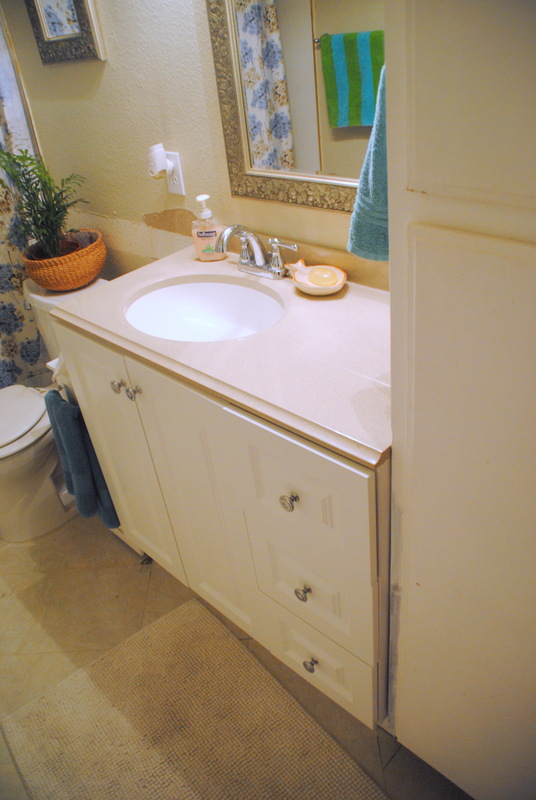 One last tip, when I was working on the cabinet I took off the doors so I could easily get to the plumbing components and my tools a lot easier. Okay, I’m just a few weeks away from my self imposed deadline to blog about all the projects on this list so I can catch up and keep moving with new projects in the house. Except I’m wayyyy behind because I never seem to blog twice a week or with any sense of regularity, really. So where do I get stuck? 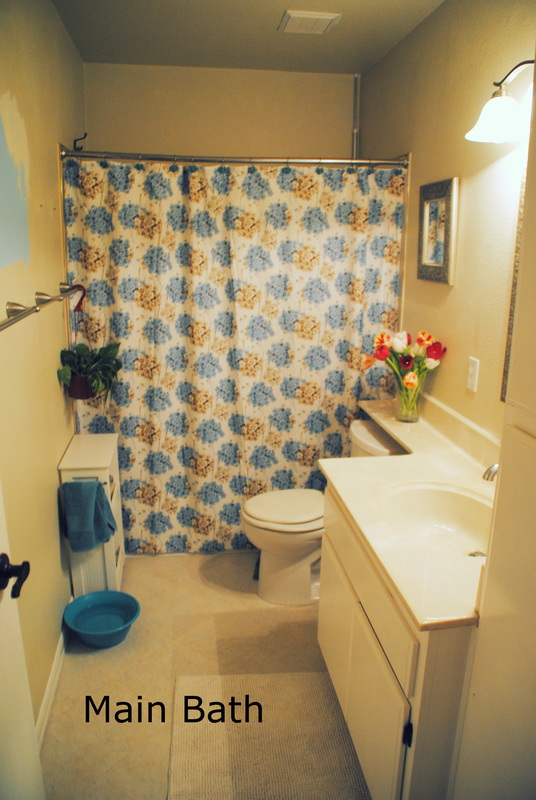 Primarily when it comes to photographing the finished project, uploading those pics to my computer and hitting publish. Of the 30 total posts I wanted to share I’ve finished 16 of them – which to be fair, isn’t bad, but also means I have 14 more to do. Therefore desperate times, desperate measures. For the month of September, and starting now, I’ve blocked Pinterest and other time-sucking sites from my computer. I’ll be completely off Facebook unless I’m working specifically in the groups I mentor. While I can’t take off time from work just to focus on blogging (ha! what a dream that would be), I am giving myself time to take the photos and finish up those posts I wanted to do. See the full list here. And wish me luck. and then I decided to remodel the room and in an effort to make it lighter I sold all but one of those bookshelves; I haven’t missed all the space and took the chance to drastically downsize my collection. Although I still have plenty of books, I decided to box up the series that I don’t read frequently and only keep out the ones I read and reference regularly. 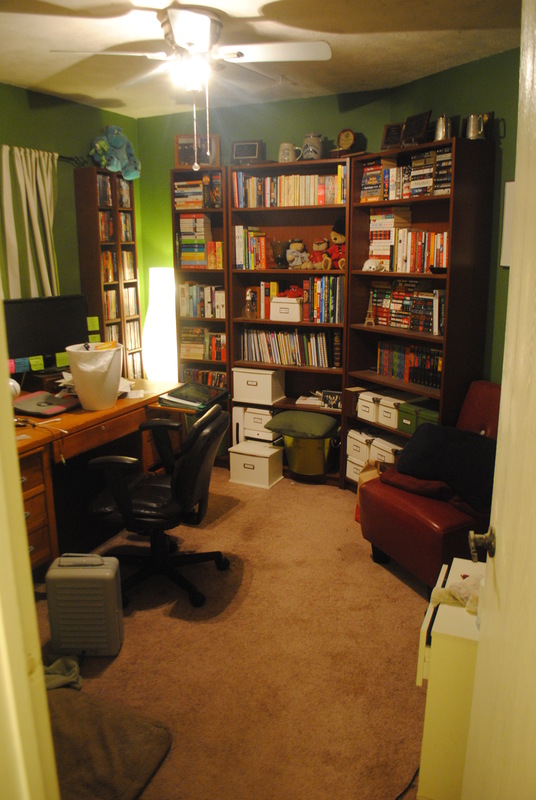 At some point I might add built in bookshelves to the guest room but until then I like having them organized. To start I picked up a few dozen book boxes from UHaul and then I organized the books as much as possible, to keep books from the same authors together. I boxed up 17 boxes and to keep it all straight I typed each of the titles, authors and series numbers into an Excel spreadsheet. I designed each page to be just one sheet when printed and then put a copy in each box. The top of the box was closed with clear package tape and a bright Post-it with the number of the box. 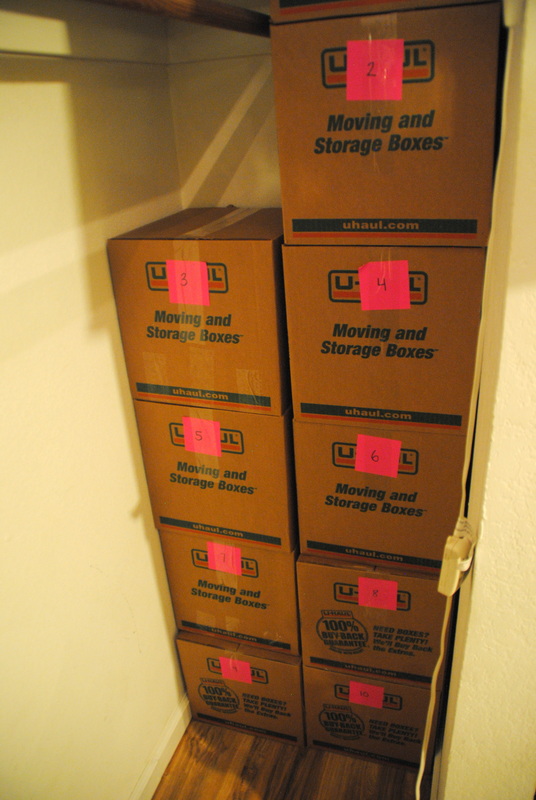 At first the boxes were stacked in the guest room closet but it was taking up too much space. After some consideration I moved all the boxes to the master bedroom closet since the deep alcove is hell on hanging clothes. The best part is that I can fit them 2 boxes deep and 17 boxes doesn’t take up the whole space. I do have a few build projects on the horizon for the books I did keep – namely those in the living room but that’s for another post. 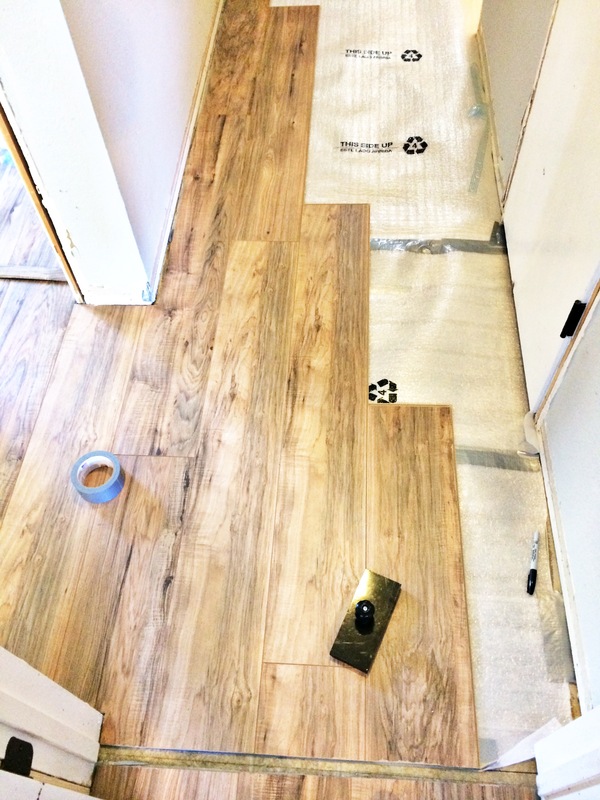 Last time I left off on the saga of the floors I had just finished the guest room and run the laminate floor boards across the hall to the threshold at the office. 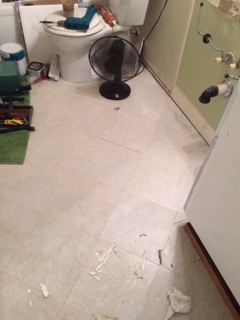 You can see the oh-so-classy laminate tiles that were in the hallway. 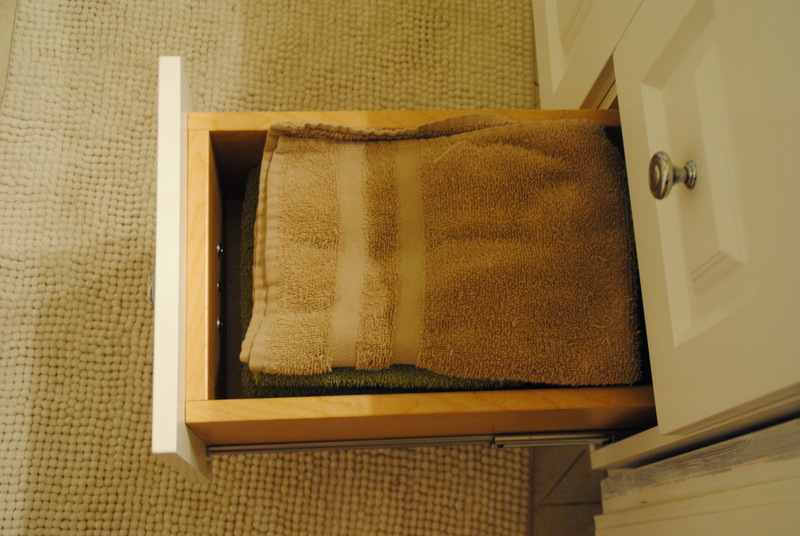 Their only redeeming feature was that it was incredibly hard to see dirt because they were also impossible to clean. 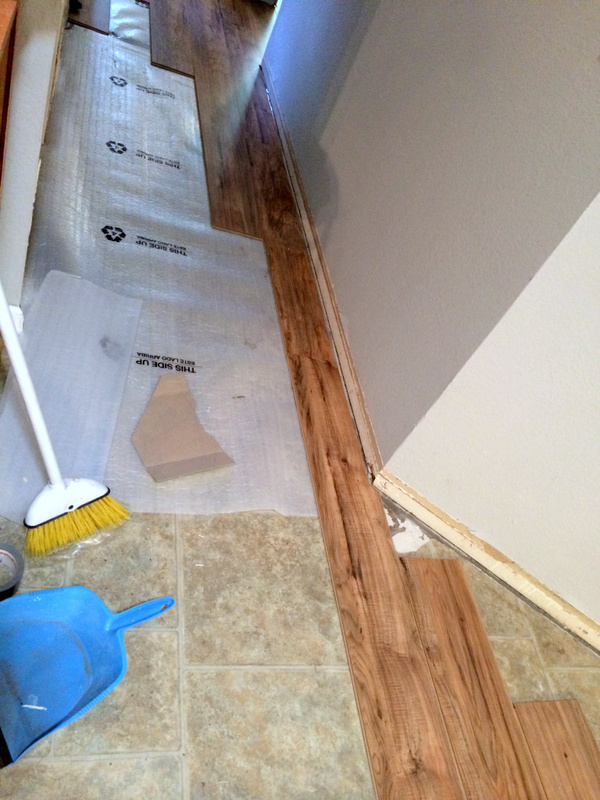 Once I started down the hallway I knew that I wanted to get to the end which of course presents a problem… you can only lay a board out as far as the previous row is laid. 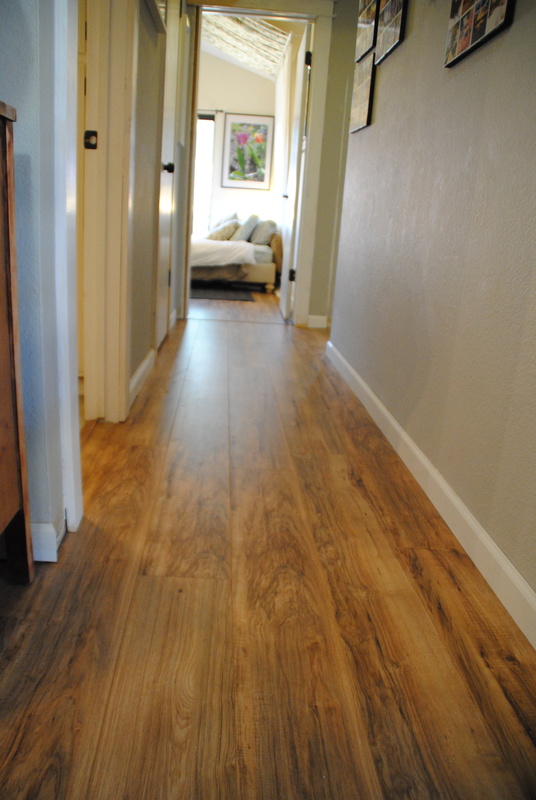 Which meant I needed to go all the way through to the living room in order to get 5 boards wide in the hall. 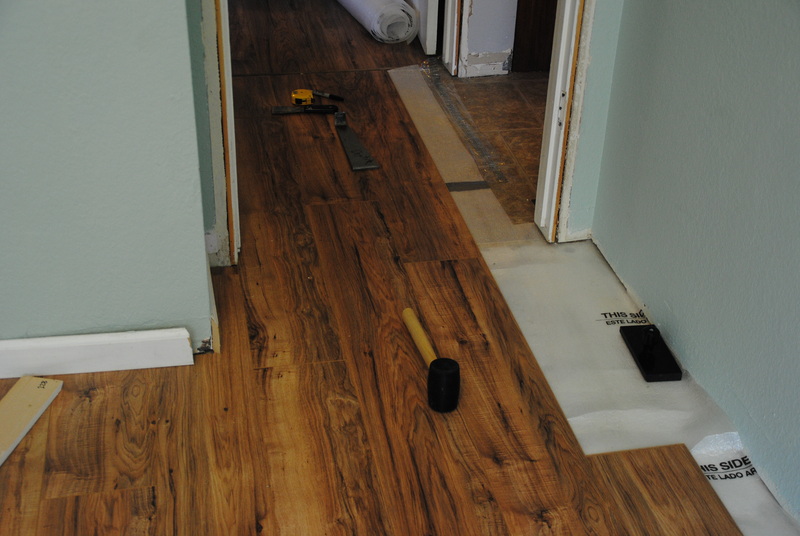 As you can probably tell I’ve removed all of the door frames and baseboards before putting down the underlayment. p.s. I changed up the lights here too and the rope LED light is super bright. See details here. In order to finish row 5 in the hall (which is the left most row in the pic), I had to take the boards into the entryway where the front door swings in. Yes, this is the other side of my odd wall in the office if you’re trying to orient yourself. As you can probably tell I needed to take out the carpet in the living room and prime the subfloor. 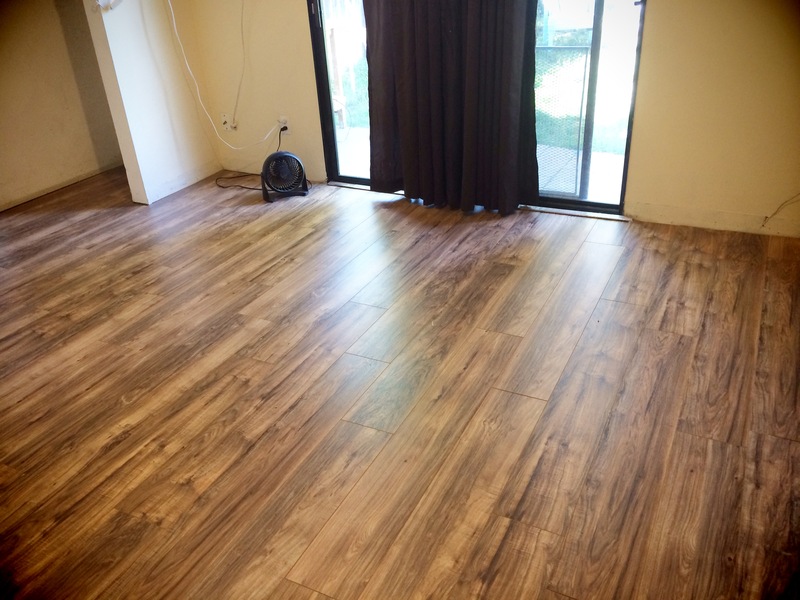 Since the furniture in here had nowhere to go I would literally remove 3′ of carpet at a time and prime as I went. It was slow going but eventually I got all the rows in and secure, some with multiple angled cuts so… that was fun. Unfortunately I didn’t leave enough of a gap for the transition strip by the front door so I did have to go back and trim it back. 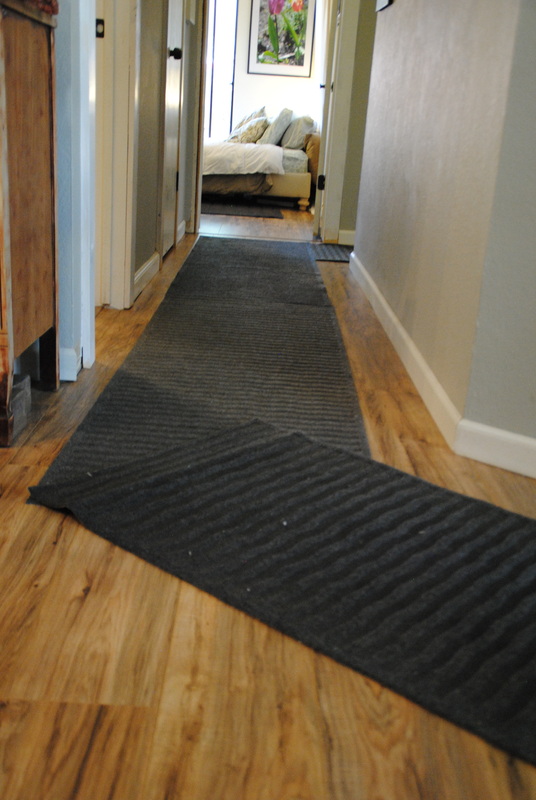 Now of course I thought I’d do the hallway and take a break but once you start taking out carpet it just makes sense to finish the job. Next time I’ll detail now I did the biggest room (living and dining), those annoyingly precise cuts around the fireplace and backing up into the kitchen.